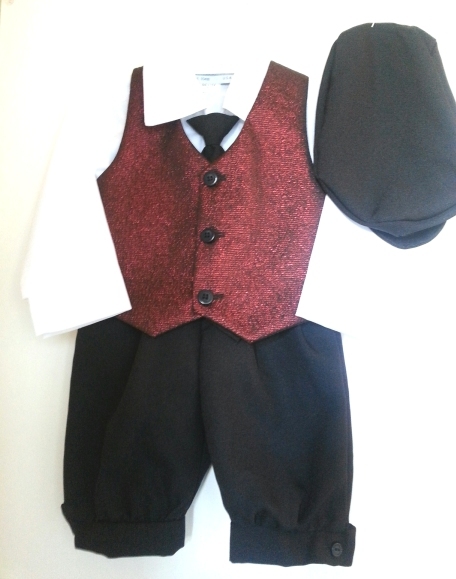 DapperLads - *Exclusive* Holiday Burgundy Jacquard Vest and Black Knickerbocker Set - Knickerbockers - US made Victorian fashion boys knickerbockers sets with genteel nostalgic appeal. DapperLads Design Original - Made in the USA. The shimmery textured jacquard vest in burgundy creates a rich formal look for this knickerbocker 5 - piece set. The vest has a solid black back. The set includes black knicker pants, cap, clip-on long tie, a white cotton-poly dress shirt and the vest. Machine wash. The vest should be washed separately on delicate.